Finally in Beijing, a 100 degrees and smog, enough to be equivalent to smoking three packs of cigarettes a day. First to Tiananmen Square where we saw the Electronic Count Down Clock for Hong Kong to become part of China again. This was the only place we saw any mention of the move! Mao still has his picture on one wall and we wondered how long that will last. Of course by now, 2004, this is a thing of the past as I review my web pages! Next we saw the Forbidden City which was large but most of the buildings looked alike after a while. The next day we went to the Great Wall and it and the location are spectacular. Go to the "Chuck on the Great Wall" link for a description of the wall! We also sent to a cloisonné factory to see how they make those fantastic items. After we saw how they manufactured them we went to a huge show room where they sold every item that could be covered with cloisonné. When I went to pay for some items I bought, two young women, clerks, kept pointing at my ear and laughing. I paid and when I tried to leave they kept chasing me around. Finally a couple of people in our group told me to stop running around and let the clerks do what ever they wanted to do. Excuse me! Well, when I decided to stop and talk to them they pointed to my ear and showed me they had a cloisonné earring to give to me as a present. How very nice of them. Diplomatic relations all because of an earring! Select any of the following menu items to skip to a description of each place that we visited. 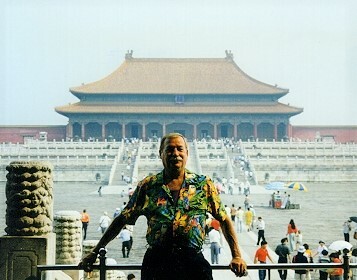 Here I am in front of one of the temples in the Forbidden City which lies on the edge of Tiananmen Square. Formal access to Tiananmen Square is through the Zhengyang Gate, which marks the boundary of what was once an enclosing wall of grey stone and brick. The tomb of Chairman Mao is centered in the path of the gate. The square itself is fairly recent. It used to be filled with shops and alleys, as the streets surrounding it still are today. Tiananmen is large enough to diminish the impact of two enormous and recent additions to the center of the city. On one side of the square lies the People's History Museum and on the other, the Great Hall of the People. The Great Hall is used for major meetings of the government and State occasions. Elaborate receptions are held there for foreign dignitaries and it contains over 50 rooms, each dedicated to a particular province or minority. The square serves as a setting for the Imperial City in which lies the Forbidden City. The red walls, golden roof tiles, and the portrait of Mao Zedong contrast strongly with the surroundings of grey and buff. Thousands of tourists from all over China visit the Forbidden City daily. Fred observed at this point that we were of as much interest to the Chinese as was the Forbidden City. Westerners still are a rare sight. At one time there were vast gardens and parks adjacent to the Forbidden City where the elite could walk freely. Although urban encroachment has swallowed many, we visited Zhongshan Gongyuan, named after and anchored by a statue of Sun Ya-tsen. If that is confusing try this; Sun Zhongshan is the formal name for Sun Yixian which is the new spelling of the informal name of the person we call Sun Ya-tsen or Sun Yatsen. Sun is the family name and Zhongshan is the given name. In China, to indicate respect, admiration, and fondness the given name is often used. Therefore, Zhongshan Gongyuan is Sun Ya-tsen Park. By whatever name, the park was beautiful. It was a Sunday and the place was filled with the laughter of children and the sight of couples strolling among the trees. Children were often dressed in their finest so that their parents could take their pictures. There was a long winding covered walk that ran through the trees. A path eventually led us to a building which housed a formal garden. Kay discovered the magic and shed off the fatigue of 35 hours of traveling to relax and discover China. The Forbidden City consists of two parts, the Outer Court and the Inner Court. The Outer Court centers around the Hall of Supreme Harmony, the Midway Hall of Harmony and the Hall of Military Prowess. The Inner Court centers around the Hall of Celestial Purity, the Hall of Union and Peace and the Hall of Terrestrial Tranquility, which are flanked by the Six East Palaces and the Six West Palaces. The layout is orderly and symmetric. The picture shows the Forbidden City viewed from the east. The Gate of Supreme Harmony 657 X 382, 106Kb During important ceremonies presided over by the emperor, guards of honor lined up on the square between the Meridian Gate and the Gate of Supreme Harmony, the largest square in the palace complex. The Hall of Celestial Purity 534 X 480, 151K The three main halls in the Inner Court are the Hall of Celestial Purity, the Hall of Union and Peace, and the Hall of Terrestrial Tranquility. The picture shows the front chamber of the Hall of Celestial Purity, where the emperor attended to state affairs almost everyday. The Hall of Preserved Elegance 576 X 404, 109K The Hall of Preserved Elegance, one of the Six West Palaces, once served as the residence of Empress Dowager Cixi. Pavilion of Cheerful Melodies 409 X 544, 111K The big stage in the Pavilion of Cheerful Melodies in the eastern section of the Forbidden City. With a height of 20.71 meters, the three-story stage was equipped with trap doors for actors to present scenes in heaven, in the human world, and in the nether regions. Beijing Although Beijing is an ancient city and was often used as the capital by one warlord or another, its modern history as a capital begins in the Yuan dynasty (1271-1368) with Kublai Khan, grandson of Ghengis Khan. It is here that Marco Polo made his base as he visited and traveled with the Khan. He spent over 20 years as a guest of the Khan before returning to Europe with his vivid descriptions of the great civilization to the east. Most of what we see today in Beijing was built during the Ming dynasty (1368-1644). It is a city built to inspire; to awe the populace with the power of the emperor. Built for the rites and ceremonies performed to maintain the Mandate of Heaven as well as for defense, it achieves grace through power and size rather than through ornament and variety. The Ming's looked to the past for their design. Beijing, like most major cities in China was built with a series of concentric walls. The outermost wall surrounded what was the Chinese city. A major highway which provides access to the outskirts and links the city with the major arteries to the rest of the country sits on its bed. At various points along the highway you can see the guard towers which loomed above the old gates to the city and provided early warning of invasion. One might regret the loss of this ancient wall, but the alternative would have been to raze whole neighborhoods in one of the most densely packed cities in the world. King Wu was the first to declare Beijing the capital city in 1057 BC. Subsequently, the city has gone by the names of Ji, Zhongdu, Dadu, and finally Beijing when the Ming Dynasty Emperor ChengZu chose the name in 1421. Beijing City is an independently administered municipal district. She is situated in the northwestern part of China at an elevation of 43.5m above sea level. The climate in Beijing is of the continental type, with cold and dry winters and hot summers. January is the coldest month (-4 Celsius), while July the warmest (26 Celsius). Beijing has a whole area of 16808 sq km (about 6500 sq mi), stretching 160 kilometres from east to west and over 180 kilometres north to south. She has 18 districts and counties with Dongcheng, Xicheng, Xuanwu, Chongwen, Chaoyang, Haidian, Fengtai and Shijingshan in the surburbs and Fangshan, Mengtougou, Changping, Tongxian, Shunyi, Daxing, Huairou, Miyun, Pinggu and Yianqing in the outer suburbs. Population in Beijing is about 12 million. Panorama of the Forbidden City, which occupies a total space of more than 720,000 square meters. The buildings in this palace complex are measured in 9,999.5 bays. The surrounding palace walls are 10 meters high and have a total length of 3,400 meter, and are protected by a 52-meter-wide moat. The Imperial City As you cross the bridge in front of Mao's portrait and enter the Imperial City through Tiananmen (Gate of Heavenly Peace) you see the Meridian Gate which leads to the Forbidden City. Only those who had official business with the emperor or one of his ministers were allowed inside the Forbidden City. That doesn't mean that it was a quiet place. It was the center of vast empires. There were hundreds of ministers who had offices there or in the immediate area, there were probably over a thousand servants, and then there were the palace guards . . . At one point there were over 70,000 eunuchs attached to the Forbidden City in one capacity or another. Today the area is filled with museum offices, ministries, tourists, small souvenir shops, and restaurants. The first Ming capital was at Nanjing. The first Ming emperor Hung Wu wanted to rid the country of Mongol influence just as he had rid it of Mongol rule. Traditional rites and ceremonies of the Chinese were brought back and celebrated. Nanjing was close to the supply routes from the southern breadbasket and provided much better communication with the provinces both for defense and administration. Yongle (Yung Lo), the third Ming emperor, overthrew the second Ming emperor from his stronghold in the northern provinces. He gave up the advantages of the southern capital and moved his capital to Beijing for political support. He continued to emphasize Chinese and Confucian principles and incorporated them into his design for the new northern capital. The design of the city reflects a return to Confucian principles of order, ethical conduct, and the importance of rites to express filial duty. The emperor was the Son of Heaven and this was the source of his Mandate to rule. All others owed filial duty to the emperor. Yongle sent a survey team to catalog the city of the Yuan dynasty and then he had it destroyed. The new city would be Chinese. Over two hundred thousand workers dedicated 20 years to the building of the new city and palaces. The Palace wasn't finished until 1421. As you go through the gates and penetrate the depths of the city, it is still possible to feel the remove, the isolation from common concerns required by and of the emperor. As you cross an open courtyard, you approach the Hall of Supreme Harmony where vigorous final examinations were given to scholars during the early Ming dynasty. The Ming emperors revived and expanded the civil service system which required mastery of the classics to enter government service. If a family could educate a son to this level, the entire family benefited and the scholar became a revered figure among the ancestors in following generations. The system continued until the early 1900's and provided stability to successive governments. After the Supreme Hall of Harmony, you encounter two more major structures; the Hall of Middle Harmony and the Hall of Perfect Harmony, which were also used for public functions. Only as you retreat further and further into the center of the palace do you find some sort of quiet and repose. The actual quarters of the emperor are rather simple by palatial standards. The low slung buildings have large rooms, but not so large as to uncomfortable for daily living. The Imperial family would never be alone. There would always be someone in attendance. The emperor ate with an attendant at his elbow to remind him not to take more than three bites from any dish. If he had a favorite dish, he had to keep it to himself and hope that by accident it would show up again. Poison and assassination was a constant presence in daily life by dint of the measures used to prevent them. Imagine living and accepting a life of such paranoia that your fears of those close to you were as great as the fear of threat from outside. Mao Zedong lived a similar life in his compound adjacent to the Imperial City. His thorough knowledge of classical history led him to adopt many of the same personal safeguards developed through the centuries of dynastic reign. The Temple of Heaven -- Tiantan Park The Forbidden City and the three Halls of Harmony look directly south, toward the Temple of Heaven. Twice a year at the Winter Solstice and again in the fourth lunar month the emperor would proceed from the Forbidden City to the Temple of Heaven to ask for blessings for the people. He would dress in the Hall of Middle Harmony and then go to the Hall of Supreme Harmony to form the procession. The streets between the Forbidden City and the Temple of Heaven were cleared. All doors and windows would be shuttered, the people closed in behind them. It was forbidden that a commoner look upon the person of the divine emperor. The procession, made of all high ranking ministers marching in order of importance, would go through the Meridian Gate, out through the main gates, and cross what is now Tiananmen Square. Only the emperor could use the center doors. The two side doors were designated for either the military or the civil ministers. Separating the military and civil ministers was a custom which arose after many squabbles about rank and order of precedence between the two branches of government. When they arrived at the Temple of Heaven, the emperor would retire to the Hall of Abstinence to meditate and pray alone for the night. Sacrifices would be prepared in the triple roofed Hall of Prayer for a Good Harvest. Just before dawn, he would rise and prepare. Each ritual, movement, utensil, and costume had purpose and symbol. The emperor wore a blue gown embroidered with gold, the roofs of the buildings were tiled in blue -- a sacred color symbolizing Heaven. Just as the gold roofs of the Imperial Palaces were only used on buildings of the emperor, blue was reserved for Heaven. The procession passed down a long elevated concourse to arrive at the Altar of Heaven. Three tiers of white marble glistening in the false light of predawn lent beauty and majesty to the ceremony, the only roof -- the Heaven above. There, as the tip of the sun shown over the horizon, the emperor would offer the animal, grain, and silk sacrifices which had been prepared the previous day. This ceremony was first performed in the Zhou dynasty (1100-771 B.C.). The last time it was performed (December 23, 1914) a republic had been founded and Yuan Shikai, the President, wore the imperial robes of the emperor. These rites linked culture and tradition through multiple dynasties. The cost of this heritage was painful. Hundreds of thousands of workers labored to build the palaces and fortifications at Beijing, Xi'an, Nanjing and other major cities of the Ming dynasty. Taxes were deep and production was diverted to provide material for the construction. Due to graft and corruption, much of the good farm land was used by the nobility for pleasure sports or mismanaged until it was barely productive. By the end of the Ming dynasty, the population of the country had been reduced by about half through starvation. While reviving Neo-Confucianism the rites and rituals, they forgot the Confucian ideal that good government takes care of the needs of the people first. Today the grounds of the Temple of Heaven are a welcome relief from the dense crowding of the city. Each day, but especially on Sunday, thousands come to walk, play, practice Dai Qi, listen to or play music and fly kites. I spent an hour listening to a group play selections from the Beijing opera. An elderly woman sang. I was told that she had only studied for the past four years -- after her retirement. Her voice was as clear as a bell; she easily sang some of the most difficult trills. The long covered walk which leads to the main Temple is a meeting place, gaming room, private club, and way of life. Mahjongg and dominos are the most popular choices, but you also find Chinese chess , card games, and dice. A group of women were doing complicated march/dances in formation while playing a straightforward beat on their drums. They may or may not have been practicing for some future performance; just doing it is enough for many groups. Watching is also a popular pastime. Activities from a game of mahjongg to the women marchers were surrounded by groups of spectators. It takes three days to get to the Summer Palace if you go by barge along the canals and river to Kunming Lake in an imperial convoy. It takes about a half-hour by bus. The Summer Palace seemed like a remote "get-away" for the emperors who were enclosed in their own stifling prison. The "palace" is actually a garden encompassing a small mountain, a lake, a river, and innumerable buildings. Most gardens in China are places to enjoy the shape and contour of nature. The gardener creates a perfection of nature and tries to encourage appreciation of its beauty. It has little resemblance to what we would call a garden. Qianlong of the Qing dynasty, built a garden here in honor of his mother in 1750. He expanded an earlier Ming temple, enlarged the lake and called it Kunming Lake, and renamed the mountain the temple stands on from Jug Mountain to Longevity Mountain. His name for The Summer Palace was the Garden of Pure Ripples. In 1860 the British and French destroyed the Garden of Pure Ripples as well as Yuan Ming Yuan (what we call the Old Summer Palace). Yuan Ming Yuan comprised acres and acres of buildings housing the treasures of China. The British and French were "negotiating" with the emperor to get better trade agreements. Victor Hugo wrote an open letter at the time, deploring the action and calling it one of the great tragedies of history. The Dowager Empress Cixi began rebuilding the Summer Palace in 1873 for her retirement and renamed it Yi He Yuan -- Garden of Peace and Harmony in Old Age. That remains it proper name in Chinese. The Dowager Empress Cixi served as regent and was able to channel funds from the treasury which had been targeted for the navy. She is often blamed for the easy victory won by the Japanese navy and the subsequent humiliation of the Chinese government in 1895. It was burnt again by Russian, British and Italian troops in 1900 as retaliation for the Boxer Rebellion. Cixi began rebuilding in 1902 and actually got to use it for awhile. She died in 1908. We entered the grounds through the back door to visit "little Suzhou" in full sunlight. This village was build to replicate one near Shanghai to give the emperor the illusion of shopping and exploring its beauty. Eunuchs and ladies from the court would play the roles of shopkeepers and artisans while the emperor meandered through the stalls. There is still a feeling of play-acting as you go from shop to shop. The only thing that seemed quite real was the river. We climbed Longevity Mountain to the Lama Temple at the top. On the way you could begin to appreciate what Cixi had planned. The entire garden is laid out to create moments. Cixi would have an entire wall built so she could put a window in it. As you walked along the wall, your senses would relax and the sudden view framed by the window would recall the freshness of the view. The Marble Boat was built by Qianlong who compared the boat to the state and the water to the people. The people keep the state afloat and without their support the ship sinks. Cixi changed the top of the boat, adding the superstructure and paddle-wheels. She also installed a large mirror in the cabin so she could sit gazing at it on rainy days. The mirror would act as a frame for the different views behind her. The names of the sights at the Summer Palace are as much a part of the experience as are the structures themselves: Hall of Dispelling Clouds, Strolling through Painted Scenery, Floating Heart Bridge, Gate of Welcoming the Moon, Hall for Listening to Orioles Sing. While the Summer Palace is not a simple thing, part of its purpose is to enhance the perception of and enjoyment of simple things.